You’ll find the video transcript at the end of the post. Now on with the original post. You can optimize a page for more than one keywords but you shouldn’t spend too much time optimizing multiple pages for the same keyword. I remember an old mentor telling me this years ago. While it is possible to have multiple rankings in the search engines for a specific search term, your effort is better spent by optimizing the different pages on your website for completely unique keyword groups. Many SEOs speed through this process without really planning or properly mapping keywords. Once they complete the keyword research process they simply dive into on-page and off-page seo. The typical result is that the homepage gets the focus for most of the keywords which can result in an over-optimization of the homepage both in terms of on-page and link building. It’s important to take the time and do this process and planning right. Keyword mapping is the process of assigning or mapping keywords to specific pages on a website based on keyword research. Based on your mapping process you are able to then make specific on page seo recommendations to help make the page more relevant to the mapped keywords. This is a huge part of what involved within the initial search engine optimization for a new website and is the foundation of what gets delivered to the client for on-page SEO projects. Keyword mapping, once you understand the process, is quite simple. Personally, I like to take two steps before mapping keywords. You need to know what keywords you’re going to be working with and mapping to the website. Proper keyword research is very important here. Uncovering both head and long tail keywords will help you create a well planned mapping document. Don’t get caught up in having to rank for every good keyword that you find. You’ll work with the client to set expectations, during the keyword research phase you are simply finding opportunities and understanding the industry. Once you have a solid list of keywords within the industry and potentially geo-graphical location, you’ll want to move into mapping them to the most appropriate pages. The idea of keyword mapping is that we’re going to be assigning these keywords to the pages that we want to rank for them. To do this, we’ll need to ask the question, what page is the most relevant to this particular keywords?, for every keyword that we’ve identified. There are usually groupings of similar keywords – variations of positions, plurals, synonyms, etc – that get mapped to the same page so it should cut your time down a little bit. The first step to assigning the keywords to to figure out which pages are the most relevant in terms of both you as a human being and Google as a search engine. Hopefully these two are aligned, but if they aren’t I always go for me as a human being. If I wanted to map the keyword link building to the most relevant page, as a human being I would likely pick the link building post here as I think it matches the searcher intent and topic the best out of all the content on the website. However, we’ll need to confirm that Google agrees by checking it with a site: modifier. 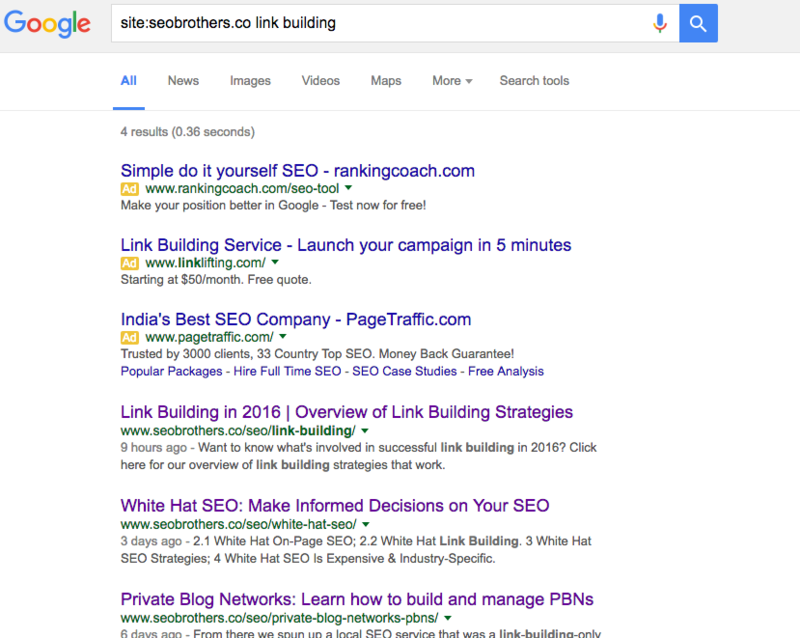 As you can see when we search Google for a site:seobrothers.co link building (replacing the keyword and website with your own) we find that Google returns the same link building page as the first result. This confirms our thoughts about it being the most relevant page. It is safe to map that head keyword (and likely some long-tail keywords to that particular page). To help keep things organized and to best deliver an on-page optimization document to your client you will want to prepare a keyword mapping document. This can sometimes be called an on-page optimization document or an SEO change document. Different companies and agencies may refer to it as something different but it should do the same thing. I like to pull the existing page data and then make a recommendation on what the new page data should be. I feel this adds a bit more value to the client because they can see what you did in terms of work to get things aligned better with the keywords. Also, what you don’t see there is some notes for each page – they can include body content recommendations, word count recommendations, image alt tagging recommendations, etc. While the mapping process is really only assigning the keywords into the mapped keyword column, this is the foundation on which you will create the recommended page data for each page and ultimately what you will deliver to the client. There are some slight differences in both the document and how you would map the keywords in each scenario. With a new website, chances are you will have some sort of sitemap to work from (or have already put that together yourself). You can use each of the pages from the sitemap for the document and work from there. In the case of a redesign, you’ll likely have a set of pages and URLs from the old site. Be sure to use the updated URLs as they will appear on the new site (if you’ve prepared a 301 redirect document, use the final destination URLs). With a redesign it’s also possible that you may need to create pages yourself, if you have an excess of keywords that do not fit well with the proposed sitemap. In this case, just add an extra map into the spreadsheet and mark it as new. Hey everyone, Adam here from SEO Brothers. In today’s video we’re going to wrap up our keyword theme of the month with a video on Keyword Mapping. Specifically we’re going to look at why and how to map keywords effectively to your website structure. So what is keyword mapping? Keyword mapping is the process of assigning keywords – discovered during your keyword research – to specific pages on a website based on their searcher intent. Based on your mapping process you are able to then make specific on-page optimizations or recommendations to help make the page become more relevant to the mapped keywords. What does a keyword mapping document typically look like? I can’t speak on what everyone uses, but typically a mapping and optimization document is a spreadsheet where the rows indicate pages on the website and the columns contain the values of different meta-data, for example column one might be URL slug, then mapped keywords, they optimized page title and so on. Why should you go through the keyword mapping process at all? I like to break this down into two reasons. #1 – Everyone has visibility on what keywords are a priority for any given page. This is particularly important if you’re doing on-going content creation or content marketing where you have a lot of opportunity to internally link and reference other content. These mapped keywords on your core service pages or even other blog posts can guide what anchors to use when linking internally. Again, if you’re consistently publishing content, it’s easy to forget what was published a year ago, or even a couple months ago and decide to write something very similar to what was already created. In this case, if you have a similar idea it’s possible that it might be better to refresh an existing post that talks about the same topic – making it more of an authority on that subject matter. Now that we’ve covered the why and understand what a keyword mapping document looks like, I want talk about three considerations to take when doing the actual mapping of the keywords, or in other words, how do we map keywords to our website. #1 – the first consideration is to look at keywords based on their searcher intent. It used to be common practise to see very similar keywords mapped to different pages. For example, you may have seen a keyword like Cleveland home builder mapped to a website’s homepage, but then the keyword home builder in Cleveland might have been mapped to a separate service or about page. While this used to be common practise, it just doesn’t cut it anymore and ends up leading to duplicate content, thin content, or just content that focuses on the search engine and not the user. Today, we want to group our keywords based on the intent of the searcher searching for them. So it’s safe to assume that someone looking for Cleveland home builders and home builders in Cleveland has the same intent behind each of those searches – they are looking for a company that builds homes in Cleveland. #2 – the next consideration is what Google is already returning in the search engine. We talked about this last week so I won’t get into too much detail, but I like to do just a quick Google search for each of the keyword groups I’m targeting and see what they are currently returning in the top results. If the page that I want to map these keywords to doesn’t look or feel like anything Google’s returning in the top results, I either need to change where I’m mapping them, or revisit the content of the page. #3 – the third and final consideration to take is to look at the type of keyword. We talked about keyword types in the first video this month, but you’ll likely want to have similar keyword types mapped together. For example, a category page on an e-commerce website might target transactional keywords, where a blog post might target informational keywords. I think I’ll wrap things up here for now, as a parting piece of advice and something I heard from my first mentor in this space – multiple keywords can be mapped to a single page, but a single keyword shouldn’t be mapped to multiple pages. Thank you, Anvar! I’m glad you enjoyed it! Thank you for sharing your knowledge. The document structure will really simplify a whole mapping process. Thanks, Vishal. I’m glad the document treated you well! Thank you! This is very useful! Much appreciated! You’re welcome, Talia! I’m glad you found it useful. Informative post, but can we use internal links mapping at home page bottom section with an hypertag? Hi Narendra, I’m not quite certain I follow. The mapping process described above gives an overview of how to properly map keywords to main landing pages during an on-page optimization process. I always wondered how these big corporate SEO firms, didn’t know these simple and powerful basics for optimization?! Thanks, Howard! I’ll agree – you see a lot of major brands and businesses that lack a proper thought out process and solid foundation of on-page optimization. Would love to have your spreadsheet as a downloadable resource! Hi Katherine, Sorry for the delay – the resources are downloadable now! Hi Subhasish – I’m glad you found it useful. Let me know if you have any questions. Simply defined it and made clear everything for me. You are really my SEO brothers. I do have a question. Is this process also apply to eCommerce websites? Definitely. I am working with an international eCommerce website currently and while the mapping document is a lot more robust than the above, the principles and process still applies. should we perform keyword mapping before starting the development of a website or we can do this after we have developed the wesbite. Thanks for the comment. Keyword mapping is definitely an important process throughout a redesign. It really depends on the scope of the project and what’s changing. If you don’t have a good handle on what’s mapped where on the old site, you might want to understand that first and then you can best migrate that to the new structure assuming things are changing. I think it needs to happen at the same time for best results. We have a post about redesign SEO that might be able to shed some light. This should be the very first step to start on page optimization. Great article, have the clear-cut overview. Should this work on old blog posts? This seems to be useful! Will you please explain the term broken links and link building? Nice. I am also using this method. Thank you for the great info. It is a basic but most important task on your whole SEO campaign. Your explanation makes ever clearer to me.